I don't really know why but I have always been drawn to the supernatural: magic, sorcery, even vampires and werewolves, or angels and demons. If not for its same-date release here with Inception, I would have watched this earlier. 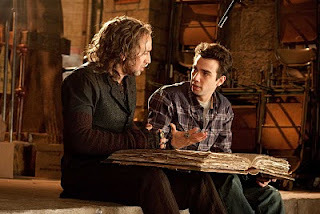 Balthazar Blake (Nicolas Cage) finds the boy who lived... ooops, sorry... the prime Merlinian (a.k.a. Merlin's great successor) who can defeat Morgana (a.k.a Merlin’s evil counterpart), and he's a reluctant but interested physics nerd. Dave (Jay Baruchel), who just wants a second shot at getting the girl of his dreams, manages to juggle romantic dates and plasma-generating or levitating practice sessions. Together they need to defeat Maxim Horvath (Alfred Molina), a heartbroken-betrayed sorcerer out to free Morgana (who, by the way, is trapped in an enchanted Matryoshka doll everybody kept referring to as the Grimhold). Thing is, it's all about Dave really. But how would a distracted crazy-in-love newbie sorcerer vanquish the evil witch and her magical minions? The Sorcerer’s Apprentice is actually worth watching if only for Baruchel’s eccentric comedic timing, even if it just works half or most of the time. That or maybe his geeky comedy stands out in a sea of slapsticks. Or his jokes make references to things my generation can easily relate to. Cage is a perfect example of an actor dedicated to his roles that he changes hairstyles for them, even if it means having a bad hair day. I think the Cage-Baruchel partnership is okay, but maybe it could have been a better mix. Alfred Molina is greatness─greatness waiting to burst out (but he wasn't able to do much) in the small role he’s given. If he had more screen time, he would have overshadowed everyone else. I thought the women in the film had strong roles, but they’re there for the usual love angles, or just as pretty faces. I’m not sure if it’s because of the actors or the script; I think the film doesn’t do justice to romantic executions. After all the Happy Potter films and the Happy Potter-wannabe films, simple magical effects sometimes just doesn't quite cut it anymore for an adult audience. (Kids would probably wow on it though.) I kept waiting to see something more magically grand, if there's such a thing. But it attempted to merge magic and science, so what the heck. You'll learn to be content when you realize it wasn't produced to copy, rival, or surpass any other film. It was made to entertain. And as it turns out, magic is fueled by love, as almost every action is fueled by an emotion. The Sorcerer’s Apprentice gets a six-point-five out of ten, for my biased love for anything supernatural, and the Tesla coil symphony scene.